The Riverfest Committee thanks the many volunteers that are working to produce another successful Riverfest celebration for 2018! Did you know that 14 Monticello organizations work together to produce the Riverfest community event?! Mark your calendars now for 2019 Riverfest which will take place July 11 thru 14, 2019. Congratulations to Mr. David Murray who was honored as the 2018 Citizen of the Year! Thank you for your service to our community, volunteering in so many ways: Meals on Wheels, food shelf, and American Legion for starters. We do appreciate the many ways that you contribute to the community and help make Monticello a better place to live. Grace Schillewaert, sponsored by Loch Jewelers is the newly crowned Miss Monticello. 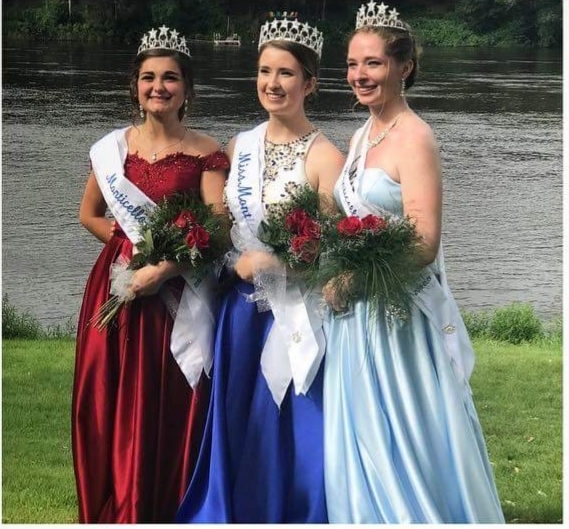 Princesses Meghan Larson, sponsored by NAPA Auto Parts, and Sydne Jude, sponsored by Bliss Salon, were crowned along with Grace to serve as your new Monticello Royal Ambassadors for 2018-2019. Sydne Jude was also recognized by her peers with the Miss Congeniality award, presented by sponsors Monticello Women of Today and Loch Jewelers. Congratulations to these young ladies as they start their reign! Best of luck to 2017-18 Miss Monticello Samantha Ziwicki as she represents Monticello in the 2018 Minneapolis Aquatennial festivities. Tom Moores of Monticello (Silver Creek) was honored at the 2018 Riverfest by the Minneapolis Aquatennial Commodores for his outstanding volunteer service in the community. Congratulations, Tom, on this well-deserved honor! Monticello 5K Race Series – then choose the tab for the Riverfest 5K and follow the links for the race results. Or click Gopher State Events race results and select Monticello Riverfest from the list.